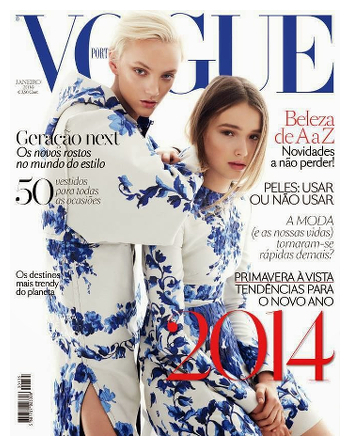 Rising stars April Tiplady and Maddison Brown are Greek chic on the cover of Vogue Portugal’s December 2013 issue. It’s a stunning shot, but one we’ve seen before. Vogue Australia first published this image in a spread for its October 2013 issue. ‘Generation Next’ featured Tiplady and Brown alongside other up-and-coming local girls Matilda Dods and Astrid Holler, and New Zealand’s Holly Rose Emery. Reprinting past shoots for new covers is hardly a new phenomenon. Elle Canada recycled an Elle France image of Jennifer Lawrence for its December 2013 issue cover, and Dutch Vogue used a reprint from Doutzen Kroes’ Vogue UK editorial for its June 2013 cover. And just four months ago, Spanish Vogue chose a reprint of a reprint for its Karmen Pedaru cover. 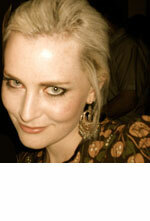 Like Lawrence’s Dior-clad Elle shoot, Vogue’s Tiplady and Brown shot is simply too good to let slip into the archives. The blue and white Valentino appears seasonally ambivalent (thought it’s really from the Fall 2013 collections), appropriate for both an Australian spring and a temperate Portugal winter. Anyway, we’ll be seeing plenty of new things from these two in the coming months. Maddison Brown had a killer run at the New York Spring 2014 shows, while Tiplady booked a campaign for McQ and caught the eye of Katie Grand, who featured her in a David Sims-shot editorial for issue #10 of LOVE. Do you think reprinted cover shots are a smart use of resources or a show of laziness?